I am extremely proud of each of my past Dogo Argentino puppies. Each Dogo Argentino puppy shows excellent characteristics of the breed standard. They will be excellent members of your family. Two years ago I mentioned that there will be eight puppies for eight very lucky Dogo Argentino owners and indeed they were eight outstanding puppies. 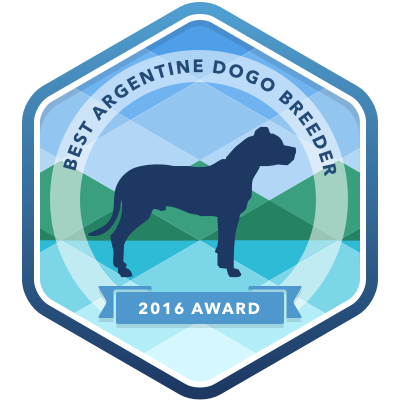 Please reserve your puppy now and join the eight proud Dogo Argentino owners. I am including some of the comments of those owners below. Male Dogo Argentino puppy. His name stands for Light because of his beautiful white coat. Male Dogo Argentino puppy. He is the first born. Female Dogo Argentino puppy. Her name stands for heal or cure. Male Dogo Argentino puppy. The strongest. Excellent muscle structure. Female Dogo Argentino puppy. Her name stands for Beautiful Nymph or Goddess. Male Dogo Argentino puppy. His name means roar, as he has a thunderous bark. Male Dogo Argentino puppy. His name stands for warrior, which best describes him. Male Dogo Argentino puppy. His name stands for guardian. Female Dogo Argentino puppy - Sunshine. Female Dogo Argentino puppy - Pride & Joy. Female Dogo Argentino puppy - Breath of Fresh Air. Male Dogo Argentino puppy - Legend. Male Dogo Argentino puppy - Determination. Male Dogo Argentino puppy - Blessed. Male Dogo Argentino puppy - Conquerer. Male Dogo Argentino puppy - Crown. Male Dogo Argentino puppy - Top Dog. Male Dogo Argentino puppy - Life.